^ Some authors (e.g., Bracewell) use our −H as their definition of the forward transform. A consequence is that the right column of this table would be negated. 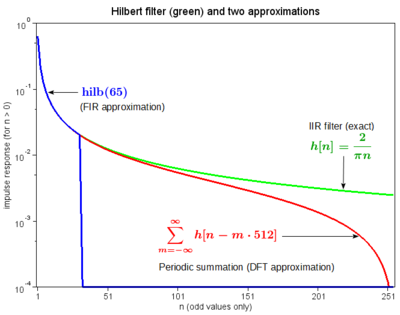 ^ 2.0 2.1 The Hilbert transform of the sin and cos functions can be defined in a distributional sense, if there is a concern that the integral defining them is otherwise conditionally convergent. In the periodic setting this result holds without any difficulty. 對 u ∈ Lp(R) 且 v ∈ Lq(R) （Titchmarsh 1948，Theorem 102）. Benedetto, John J. Harmonic analysis and applications. Boca Raton, FL: CRC Press. 1996. ISBN 0849378796. Bitsadze, A.V., Boundary value problems of analytic function theory, (编) Hazewinkel, Michiel, 数学百科全书, Springer, 2001, ISBN 978-1-55608-010-4 . Bracewell, R., The Fourier Transform and Its Applications 3rd, McGraw–Hill, 2000, ISBN 0-07-116043-4 . Calderón, A.P. ; Zygmund, A., On the existence of certain singular integrals, Acta Mathematica, 1952, 88 (1): 85–139, doi:10.1007/BF02392130 . Carlson, Crilly, and Rutledge, Communication Systems 4th, 2002, ISBN 0-07-011127-8 . Duoandikoetxea, J., Fourier Analysis, American Mathematical Society, 2000, ISBN 0-8218-2172-5 . Duistermaat, J.J.; Kolk, J.A.C. Kolk, Distributions, Birkhäuser, 2010, ISBN 978-0-8176-4672-1, doi:10.1007/978-0-8176-4675-2 . -Spaces, New York: Academic Press, 1970 . 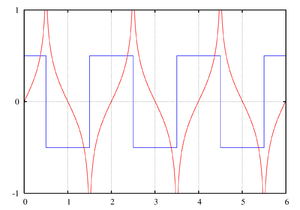 Fefferman, C., Characterizations of bounded mean oscillation, Bull. Amer. Math. Soc., 1971, 77 (4): 587–588, MR 0280994, doi:10.1090/S0002-9904-1971-12763-5 . Fefferman, C.; Stein, E.M., Hp spaces of several variables, Acta Math., 1972, 129: 137–193, MR 0447953, doi:10.1007/BF02392215 . Gel'fand, I.M. ; Shilov, G.E., Generalized Functions, Vol. 2, Academic Press, 1967 . Grafakos, Loukas, An Elementary Proof of the Square Summability of the Discrete Hilbert Transform, American Mathematical Monthly (Mathematical Association of America), 1994, 101 (5): 456–458, JSTOR 2974910, doi:10.2307/2974910 . Grafakos, Loukas, Classical and Modern Fourier Analysis, Pearson Education, Inc.: 253–257, 2004, ISBN 0-13-035399-X . Hardy, G. H.; Littlewood, J. E.; Polya, G., Inequalities, Cambridge: Cambridge University Press, 1952, ISBN 0-521-35880-9 . Khvedelidze, B.V., Hilbert transform, (编) Hazewinkel, Michiel, 数学百科全书, Springer, 2001, ISBN 978-1-55608-010-4 . King, Frederick W., Hilbert Transforms 2, Cambridge: Cambridge University Press: 453, 2009, ISBN 978-0-521-51720-1 . Kress, Rainer, Linear Integral Equations, New York: Springer-Verlag: 91, 1989, ISBN 3-540-50616-0 . Schwartz, Laurent, Théorie des distributions, Paris: Hermann, 1950 . Stein, Elias, Singular integrals and differentiability properties of functions, Princeton University Press, 1970, ISBN 0-691-08079-8 . Stein, Elias; Weiss, Guido, Introduction to Fourier Analysis on Euclidean Spaces, Princeton University Press, 1971, ISBN 0-691-08078-X . Titchmarsh, E, Reciprocal formulae involving series and integrals, Mathematische Zeitschrift, 1926, 25 (1): 321–347, doi:10.1007/BF01283842 . Titchmarsh, E, Introduction to the theory of Fourier integrals 2nd, Oxford University: Clarendon Press, 1948 (1986), ISBN 978-0-8284-0324-5 .